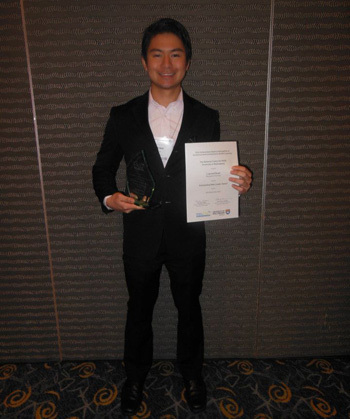 Macquarie University's very own Legrand Buan was awarded the title of "Outstanding New Peer Assisted Learning (PAL) Leader" at this year's National Peer Assisted Study Session (PASS) Forum held at the University of Wollongong. Legrand and experienced PAL leader Mary Auguste were invited to attend the PASS forum based on their superior performance and commitment to the Faculty of Business and Economics (FBE) PAL program. To be nominated for the award, a peer leader must demonstrate an exceptional combination of creativity, commitment and leadership to PAL at their institution. Applicants were assessed on aptitude and applicability of peer learning theory, student engagement methods and content delivery. Legrand facilitates both Accounting (ACCG10) and Business Law (BUSL250) PAL sessions for FBE. Last semester, Legrand made significant contribution to BUSL250 PAL sessions by writing, structuring and delivering PAL workshops in an innovative and engaging manner. BUSL250 PAL sessions piloted at the beginning of this year. Legrand attracted exemplary student engagement and participation rates in his first semester of PAL. When asked how Legrand manages to connect so well with his students he said: "I always aim to establish ties with my fellow students, to get to know them, to view things from their perspective, and place their own goals as my own. In effect, not only does this make your PAL sessions more engaging and beneficial to students; the PAL leader benefits by handling crowds. In PAL, you learn how to deal with people, and no matter which career pathway you take, this is a skill that can take you far." Legrand's draws motivation and inspiration from helping his peers achieve their learning goals. Congratulations Legrand on a wonderful achievement! Last Updated: 2015-05-26 13:28:04 by James Fehon.